Proverb G. Jacobs, Jr., Ed.D, a longstanding, inspirational and cherished member of the Laney College and Peralta Colleges community passed away, Monday, April 18, 2016. Memorial and funeral services were held for him last week. He will be very much missed. Below is his obituary, as published in San Francisco Chronicle. Proverb Jacobs Jr., a former Raiders lineman who played six seasons in the AFL and NFL, died Monday at the age of 80 from complications after a fall. 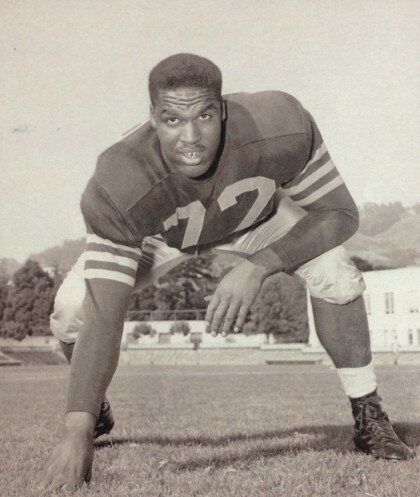 From 1958-64, he played for the Eagles, Giants, Titans (now the Jets) and Raiders. He later joined lifelong friend and San Francisco 49ers coach Bill Walsh to serve as a scout for the team. But Dr. Jacobs’ wife, Mimi Johnson-Jacobs, said his real love was mentoring young people. Dr. Jacobs taught for more than 30 years at Laney College. Born May 25, 1935, in Marksville, La., Dr. Jacobs was raised by parents who picked cotton before moving west to leave the hostile social climate of the South. He was a year old when the family arrived in Oakland, becoming part of the great migration of African Americans leaving the South in search of economic opportunity. But the West had its share of segregation as well, which Dr. Jacobs learned when his mother tried to enroll him and his siblings at Santa Fe Elementary School in Oakland. They were told that “Negroes” weren’t allowed to attend. Dr. Jacobs earned an associate of arts degree from Modesto Junior College, then transferred in January 1956 to Cal, where he received a bachelor of arts degree. He returned to Cal for a doctorate in education and also received a master’s degree in physical education from San Francisco State University. During those times, the small group of black students at UC Berkeley hung out together, said Joe Griffin, 79, a longtime friend of Dr. Jacobs. “He was a mountain of a man, more quiet than talkative, unless you knew him or he knew you,” Griffin said of Dr. Jacobs, a 6-foot-4, 250-pound offensive and defensive tackle. After his playing years he became a defensive coordinator for the minor-league San Jose Apaches in 1967 under then-head coach Walsh before he scouted for the Cincinnati Bengals and eventually joined Walsh again as a scout with the 49ers through the 1980s. The two became close friends, Griffin said. Throughout that time, Dr. Jacobs kept teaching. He also coached track at Laney, fighting to establish a women’s track program in 2003. Dr. Jacobs guided younger athletes throughout his life, coaching two-time Olympian 800-meter runner James Robinson, and mentoring Erv Hunt, a retired Cal track coach who was head coach for the U.S. men’s track and field team at the 1996 Olympics in Atlanta. He spent the last decade chronicling his life and tracing his family’s genealogy. Dr. Jacobs suffered from Alzheimer’s disease before his death. Dr. Jacobs is survived by his wife; son Proverb Jacobs III and daughter-in-law Jan Moore Jacobs; son Stephen Mayle and his partner, Della Gutierrez; and grandchildren Rachael Jacobs, Erin Jacobs and Proverb “P.J.” Jacobs IV.